With British Columbia - and the mighty Fraser River - having more than our fair share of water this summer, so it seems the mosquitoes follow. Reports from the Fraser Health System show "a definite upswing in the mosquito population." It's time to tap into our favourite bug juice of choice: Buzz Away, North America's #1 bestselling natural mosquito repellent. A recent trip the Sunshine Coast found us surrounded by the critters and caught unaware - mosquitoes at the seashore? Never noticed them in previous years. Next time, we'll be sure to arm ourselves with DEET-free Buzz Away. The chemical-free formula is lab tested to be effective and keeps bugs at bay for hours. Buzz Away is made from pure essential oils and is 100% natural. It works and it's natural -- what more could you want from an insect spray? Easy application and Buzz Away has that too. Choose from a Buzz Away pump spray or Buzz Away easy-wipe towlettes. Plus there's Buzz Away Sting Soothe for bug bite itch relief, just in case the skeeters get there before the Buzz Away repellent does. 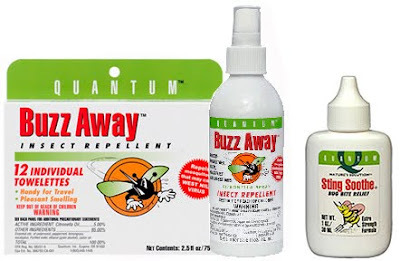 Buzz Away insect repellent products are available in Canada at eco boutique Lavish & Lime. If you have any thoughts or ideas about repelling mosquitoes and other insects, please leave a comment below. We'd love to hear from you!